A few hours back, Facebook released an update to its Messenger app for iOS and Android devices which brings in a new feature called the Voice Messages. Using the Voice Messages, Facebook Messenger users will be able to record their messages and send them out to other users. 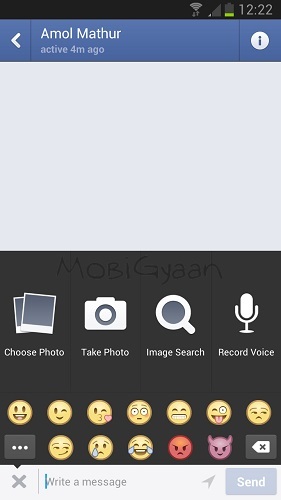 Now when users select the ‘+’ icon while they are in a chat, they are greeted with a new option called ‘Record Voice’ alongside the photo and camera buttons. When users select the Record Voice option, a Red ‘Record’ toggle appears (as below) which has to be pushed and held while you record your message and once you are done, you just have to release it and it will be sent to your friend. But if you are unhappy with what you have recorded, you just have to slide it off to cancel the message. The service arrives with a limitation which is that, Messenger users will be able to record their messages for a maximum of 1 minute. The Voice message feature works perfectly and the quality of the recording is decent enough too. There is no delay in sending of the message and the recording plays effortlessly. This new feature will surely come handy for a lot of users, especially those who wish to communicate while driving a car or are busy with something else and cannot reply instantly by typing in. While there was a rumor recently that Facebook of interested in buying WhatsApp, the news was rubbished but with the introduction of the Voice Messaging service, it seems like Facebook is going offensively against WhatsApp. 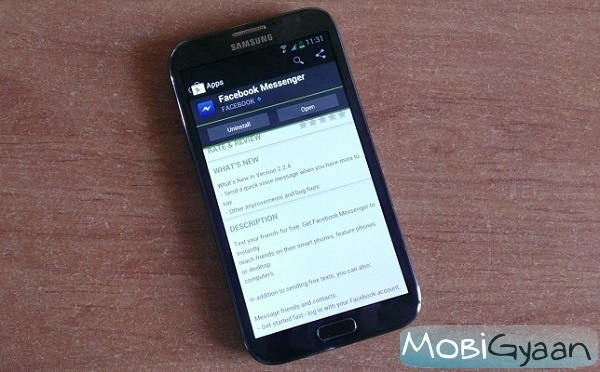 WhatsApp also has the ability to let users send voice messages for up to 2 minutes. It will be interesting to see how things turn out to be between the two companies and what next does Facebook has in store for users. 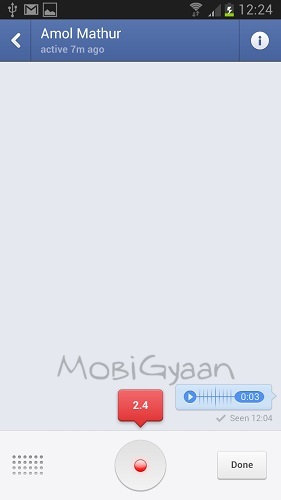 Coming back to the Voice Messages, we tried the service and liked it and you check out the Voice Messages on Facebook Messenger in action below.